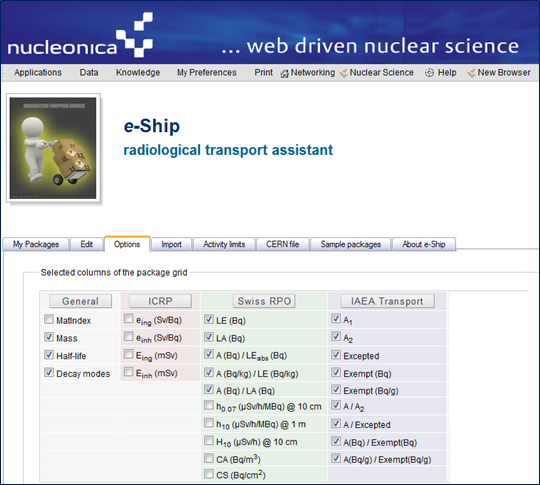 Nucleonica announces the release of a new radiological transport assistant module – e-Ship (electronic shipments). The program assists the user to characterise packages for the shipment of radioactive material in accordance with ADR/IATA/IAEA transport regulations. This powerful new application has been developed through a license agreement and collaboration between CERN and Nucleonica. In this beta release, users are invited to provide feedback on the various features and tools integrated into the application. We believe that with its user-friendly easy-to-use interface, Nucleonica’s e-Ship will be a welcome addition to tools currently used by various organisations to characterize their radioactive transports. The next Nucleonica training course will take place in Karlsruhe on 25-26 Oct. 2012. This 2-day introductory course will cover the topics of nuclear data and related nuclear science applications. The course is aimed at persons who provide technical support (measurements, interpreting results, drawing conclusions, making recommendations) for the actions in response to environmental radioactivity issues, nuclear security, decommissioning, etc. The course is suitable, for example, for physicists, radio-chemists, health physicists, technical experts etc. from the nuclear industry, nuclear research organizations, universities, regulatory authorities and nuclear medicine institutes. Completion of this course will enhance and support nuclear related decision-making as well as provide formal academic principles in nuclear science. Course requirements are a basic knowledge on physics and chemistry.The course will be held in English. Further information can be found on our training course page. The German newspaper Frankfurter Allgemeine Zeitung (F. A. Z.) 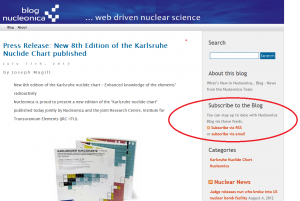 has just published (10th August, 2012) an article on the new 8th edition of the Karlsruhe Nuclide Chart. This is a new service we are offering in which you can receive new blog posts directly to you by email. The service is based on Google’s Feedburner. Just go our the blog page at www.nucleonica.com/blog and click on “subscribe vial email”.